Rend Collective. Formally called ‘Rend Collective Experiment’. Quite possibly one of the biggest groups out of Britain (alongside the now dis-banded Delirious?) to immerse themselves within the Christian music industry within the last ten years or so. One of my favourite bands/artists to come out of the U.K./Ireland area, alongside Tim Hughes, Matt Redman, Philippa Hanna and the now disbanded Delirious?. Originally signed to worship music label Integrity Music before making the jump to Capitol CMG and thus releasing the chart-topping more radio-friendly 2015 album As Family We Go (which featured the radio singles ‘You Will Never Run’, ‘One and Only’, ‘Every Giant Will Fall’ and ‘Joy of the Lord’), Rend Collective have managed to fuse together two things and do both of them well- present to us great worship music, while also pushing boundaries and creating good acoustic/folk/alternative music worthy enough of having repeat value, with their craft on a higher plane than sadly most of the modern worship music available at our fingertips at the moment. Not to discount the valid passion present in much of today’s CCM/worship communi,ty, it’s just that when a band/artist comes along that presents to us something different (and it’s a different that is great), we all ought to sit up and take notice. And Rend Collective is one such band. Now one album into their career at Capitol CMG (their 2015 album As Family We Go was unexpected, considering that the year before was their chart-topping album The Art of Celebration– but nevertheless welcomed and well-received), Rend Collective have delivered a collection of songs that will make any fan of worship music sit up and take notice- for Rend Collective have stretched and continue to stretch musical boundaries to be on the same musical ingenuity plane as other artists and bands like Delirious?, Leeland, All Sons and Daughters, The City Harmonic and Crowder, to name a few. These 5 band members out of Bangor, Northern Ireland, have always been honest and earnest with their songs. And while they are currently on Capitol CMG, it was their former years at Integrity Music that solidified them as one of today’s most heartfelt worship groups, able to bring to us songs full of heart and hope, pain and suffering, yet equal moments of reverence and awe. And it was in that spirit that Integrity Music released a best-of ‘Mixtape’ full of their chart-topping songs released on Integrity Music. Though the Mixtape album was a little redundant (with the advent of Spotify in particular), the project was, and still is, a nevertheless must-have for anyone who hasn’t heard much of Rend Collective before and want to start on a project that encapsulates the best of Rend Collective’s earlier years! 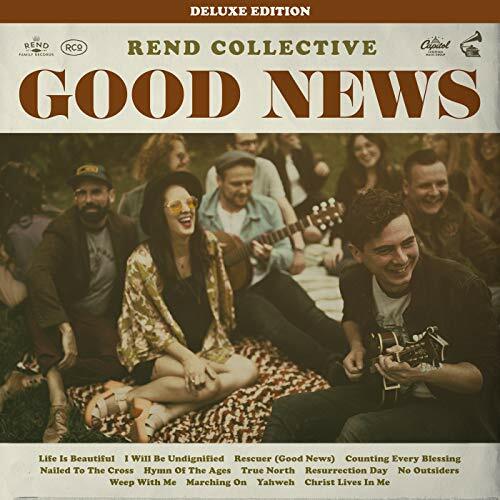 Fast forward a year or so and we see Good News, an album full of life and vitality as I hear an album that is as good as any Rend Collective album that has past, and an album that can certainly be one of my favourite worship albums of 2018 thus far! ‘…there’s a lot of bad news out there, but no matter what we have good news, and that good news has a name: Jesus Christ. Today there is nothing more powerful we can do in the darkness, in the bleakness, then proclaim the good news, then proclaim the gospel, and that’s why we wrote this song. The good Lord came to seek and save and maybe that’s a message you need to hear today. Maybe you need to know that you can be rescued. Maybe you just need to celebrate the fact that you have been rescued. Jesus is our rescuer, and there’s good news in Him…’ As the band released the title track ‘Rescuer (Good News)’ late last year as the band’s first radio single, we are reminded of the fact that the news that we have about the Lord is in fact good, and that He indeed is our rescuer, often at times on a continual daily basis…and that’s ok! As the band continue to stress, not only in this song in particular, but also throughout their whole music career thus far; good news is not just for those who appear to have it all together, but rather, it is for everyone to take hold of and claim for themselves. As the band relay on facebook about their radio single and its meaning- Who is Jesus Good news for? For the ones who feel they aren’t good enough, for the ones who feel too broken to make a difference, for those who need a second, third, and 30th chance, for everyone who needs a rescuer. Jesus is good news for EVERYONE. No matter who you are— good news is for you. ‘Rescuer’ in a nutshell is the gospel, wrapped up in an upbeat song as the band remind us all that music can still be fun as it can be impactful and inspirational- and ‘Rescuer’ is hopefully both, to whomever hears it. The church is not necessarily the four walls but rather the people we fellowship and are in relationship with, the people who sit with us and discuss love, God, life and all the rest of it, the people we are in communion with, as we all contemplate our own futures to realise that God our rescuer is indeed something that requires us to celebrate. A chart-topping and impacting song, and one to hopefully inspire us all in the months and years ahead, lead singer Chris Llewlyn and co. have once again showed us that worship music and fun-filled pop music can still be married together and not have one harm the other for whatever reason. While ‘Rescuer’ basically anchors the album musically, thematically and lyrically, Rend Collective continue to press on to deliver a new look of showing us what the gospel should mean for everyone. It is in the overarching theme of the album, that we present to the masses what is ‘good news’- for everyone, not just a select few that seem to have it all together. God’s love and message of hope and salvation is for everyone, those from all walks of life and faith, even for those who seem to disagree with everyone we as humans and Christians stand for. For God freely welcomes everyone to the table of discussion and dialogue, as we delve into what it really means to follow Christ and live a life full of hope, all the while realising the impact that Christ’s life, death and resurrection ought to have on us and how we live our lives in light of such a revelation. Good News and its songs are presented in light of the good news of Christ and our response to such a moment of assurance and certainty in whom we place our hope and trust. Starting off the album with ‘Life is Beautiful’, the band opens with a joyous melody about rejoicing as we’re reminded of how beautiful life can be when we focus not on what we can’t have or don’t, but rather be content and joyous in the things we do- changing our mindset to see the beautiful nature of what life is bringing to us at every moment, regardless of what it could seem on the surface in that moment, be it good or bad. ‘I Will Be Undignified’ is a toe-tapping Irish-inspired pub-like song that is fit for dancing sessions as the band deliver a melody thematically similar to Matt Redman’s ‘Undignified’, as we’re needed to have a timely reminder that to be undignified before the Lord is to live fully with abandon, to not worry or care about what people may say of us when we’re fully living sold out for our Father, Saviour and Friend; while ‘Nailed to the Cross’ is your atypical Sunday morning service song that will sound musically different (because of the band and their unique musical style) but lyrically very similar to many songs that have made it to Sunday morning services over the world. The topic of our sin being nailed to the cross and us being set free is nothing new- songs like ‘Nailed to the Cross’ (Rush of Fools), ‘Buried in the Grave’ (All Sons and Daughters), ‘Forgiven’ (Crowder) and ‘Grace Like a River’ (Delirious?) have all delved into the theme of sin being nailed to the cross, and the grace of God setting us free from the life that we could’ve had if Jesus didn’t fulfil what He came to do on this Earth. Still, ‘Nailed to the Cross’ is indeed a great add to the Sunday song rotation playlist at church, yet as a standout on the album Good News…sadly it seems slightly forgettable (albeit only slightly). Nevertheless, the song itself is fitting for a time such as Easter, as we reflect upon the sacrifice of the Lord for each of us. While the song itself may not be my most memorable song from the band, the song itself I’m sure has impacted a lot of people since Good News released way back in January 2018! Then there’s the songs that impact you straight in the heart, the songs that encourage and inspire, even if they weren’t trying to, in the first place. Alongside ‘Rescuer’, songs like ‘Counting Every Blessing’, ‘Weep with Me’ and ‘No Outsiders’ have made an impact in my own life, and are certain standouts on Good News, and ones that people would hopefully immediately gravitate to when hearing the album from start to finish. Written and debuted to youtube as a demo track in 2017, ‘Weep With Me’ I reckon is perhaps one of the band’s most vulnerable songs I’ve heard, well, ever! As Chris himself wrote about the song in a Facebook post not too long ago, ‘…Weep With Me is a song of lament on our new record, GOOD NEWS. A lament is a song of raw, unedited, unpolished brokenness. We don’t sing a lot of them on Sunday morning’s but we do find a lot of them right in the centre of our Bibles – in the Psalms. God can handle your disappointment, frustration, lack of faith and even anger. A lament is an opportunity to bring the “what just got real” to the real God. To wrestle with God is a form of intimacy – a close relative of embracing Him. A lament and a wrestle is far superior to running from Him in our woundedness. We need these songs – and maybe you need Weep with Me today…’ And so from this quote, comes ‘Weep With Me’, an emotional song about the valley, about the times where things aren’t right and we don’t know why. About the moments when we have to believe in the fact that the God of the light and the good, is still the God of the broken and the despondent. God is God is God, and is the same regardless of our situation. If there’s one thing that I’m sure the band would want us to grasp from this song, it’s this- that God feels what we feel, and weeps with us when things are wrong. He may fix our issues and circumstances, He may not, regardless, He’s still God and still worthy to be praised. A hopeful song that we can cling to in hard times, ‘Weep With Me’ is a song that I’m sure will impact and even heal those who hear it for whatever reason. ‘No Outsiders’ is yet another song that travels along the vein of the poignant, as the band fervently declare that there are no outsiders to the kingdom of God. Sure some people will go to hell when they die, but it wouldn’t be because of Jesus’ doing- for He who died and rose again, rose and died for everyone- sending out an invitation to every single soul. Everyone is welcome, but not everyone will make the choice. God has already done the work through Jesus, and it is up to us to accept. And so, we remember, that God’s gift of eternity with Him is free, all we have to do is freely accept, knowing full well that ‘…there are no outsiders to Your love, we are all welcome, there’s grace enough, when I have wandered Lord, Your cross is the open door, there are no outsiders, I’m not an outsider to Your love…’ Then there’s ‘Counting Every Blessing’, a song that is currently right now a radio single, and a big bolter to be included on the annual WOW Hits compilation, WOW Hits 2019. A song that is as cheerful as it is happy, bouncy and fun-filled, this notion and concept of ‘counting our blessings’ may seem cliché, but is nevertheless very true. As the band remind us through these various posts on Facebook and their website, ‘…just because we intellectually KNOW God’s promises, doesn’t mean we always feel them to be true. Counting Every Blessing came from a season of real wrestling with God because we couldn’t see his promises coming to pass. We despaired instead of looking at the signs of His goodness along the way. It’s so easy to give in to looking at what God hasn’t done yet rather than counting the blessings God has already given us…’ For we all have to be given a reminder, that ‘…I, like most people in our culture, am supremely blessed. Yet I somehow find ways to be dissatisfied with most of my blessings and wind up speaking out all kinds of negativity over a life that deserves very little. I don’t want to live like that. I want to count every blessing. And I don’t just say that because it’s the name of our single; I say it because it’s the only way to fully be alive to the grace of God…’ And so, with these two quotes, I can’t really say much more about ‘Counting Every Blessing’, a song that, like ‘Weep With Me’, has stood out for me on the album, and is one of my favourites on Good News. And so there it is…the new Rend Collective album. Standing at a whopping 21 songs (15 for the standard edition, an extra 6- various songs recorded live in Belfast, and others in an acoustic setting, for the deluxe), Rend Collective have once again reminded us that the worship music genre need not to be bland and unimaginative, like much of the current worshipful songs that are released effortlessly and even quickly as each year goes by. Yet Rend Collective as a whole has proven time and time again, that they are not your average worship band, and Good News is further indication of this fact. In fact, hear their new album from start to finish, and you’ll know what I mean. This album is such a joy to hear, and a standout in 2018 thus far- so much so that the album has been nominated for Best Worship album at this year’s Dove Awards. With so much gems to be mined, expect to listen to this album on repeat as the weeks and months continue to press on. Well done guys for such an enjoyable and thought-provoking album, maybe a full length live album (or a remix one) in the future?